“Varieties of Accident” by Leona Theis (Vol. 45.4, Summer 2018)—read the full essay here! Submissions are now open! We invite submissions of unpublished fiction, nonfiction, and poetry from all First Nations, Métis, and Inuit writers. This special issue is being guest edited by Lisa Bird-Wilson (fiction and nonfiction) and Tenille Campbell (poetry). The guest editors encourage submission of exciting, edgy, engaging (all the e’s) contemporary fiction, nonfiction, and poetry that reflect Indigenous lives, concerns, moments, thoughts, dreams, and so on. Whatever you do, don’t play it safe. Be brave! Surprise us! Did you receive our inaugural Grain newsletter in your inbox this morning? If not, check it out (and subscribe for future newsletters) here! 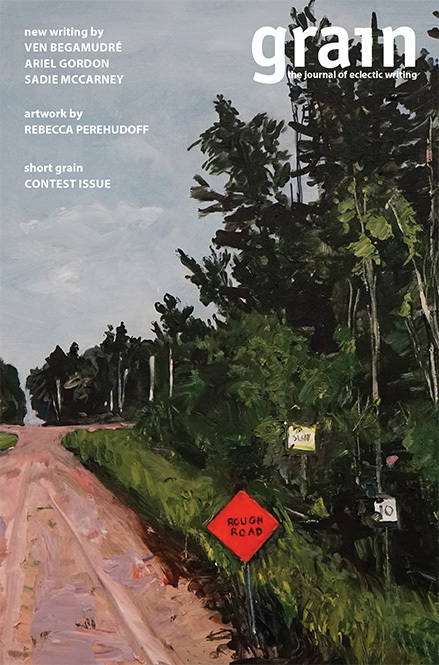 Our Fall newsletter features a preview of our new issue, a Q&A with the 2018 Short Grain Contest winners—Francine Cunningham, Francene Gillis, Nicole Lachat, Annick MacAskill, Ted McInnis, and Lauren Turner—and a glimpse into the work of our Fall issue artist, Rebecca Perehudoff! Our Fall issue is available now—buy a copy or subscribe today to save 37% off the newsstand price! Submissions for poetry and creative nonfiction open TODAY! Please see submission guidelines here. Fiction submissions will remain closed until December 1st. Due to various circumstances (staffing changes, increased submissions) we’ve accumulated a backlog of fiction submissions; therefore, our response times for fiction have been longer than usual. We apologize for the delay, but know we are working hard to catch up. Our aim is to have shorter turnaround times in the future. Your patience in this process is appreciated. 2018 Short Grain Winners Announced! We're very excited to announce the winners of the 30th annual Short Grain Contest! We'd like to thank Cheryl and Henry Kloppenburg for their ongoing support, which has enabled us to continue to hold this contest. We'd also like to thank our 2018 judges, Canisia Lubrin (poetry) and Rawi Hage (fiction), for their attentive reading and expertise in choosing this year's winners. The six winning entries will be published in the Fall issue of Grain. Congratulations to all of the winners and honourable mentions! We look forward to receiving submissions for next year's contest.